Few jobs in the military have as much mystique as Marine scout sniper. Army Ranger? Sure. Navy SEAL? Fair enough. The scout sniper has his own special reputation, though, and its one that’s earned the hard way. Nevertheless, there is room for improvement, say many Marines who know the community. Scout snipers have no primary military occupational specialty, have limited career options and cannot compete for big bonuses unless they leave their conventional infantry battalions for the bright lights of a job in the reconnaissance field or Marine Corps Forces Special Operations Command. And it’s hurting the scout sniper community as a whole, they say. 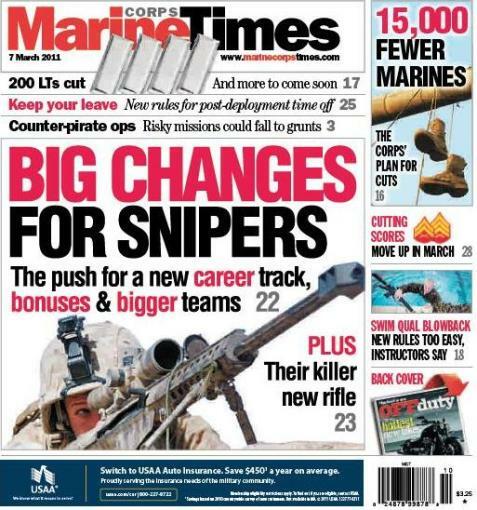 In this week’s Marine Corps Times cover story, I take a look at the push to professionalize the scout sniper corps. It’s especially relevant because the Infantry Operational Advisory Group, an influential group of Marine colonels, has pushed a recommendation up to general officers that the Corps consider big changes for scout snipers. What’s next, though? And how did the service get where it is? We lay it all out, using a combination of interviews and military documents obtained through the Freedom of Information Act. The cover story package also includes a separate story on the new sniper rifle that Marines are using in Afghanistan, and what could be fielded next. Insurgents won’t be fans, to say the least. To check it out, head down to your exchange or subscribe here.